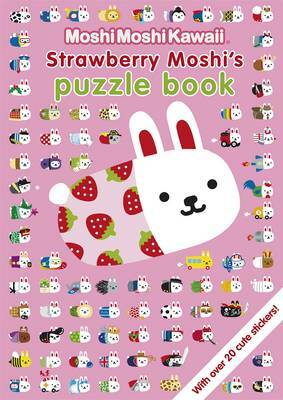 Play all the puzzle games that Strawberry Moshi and her friends have set you in this cute "MoshiMoshiKawaii" activity book with stickers. Find and colour all the Moshi, their cute outfits and their trinkets in the busy black and white scenes! With space to colour in and doodle, as well as stickers to enjoy, the fun activities include learning how to draw a Moshi, spot the difference, Sudoku, dot to dot, tangled line, matching and pretty pattern games. This book contains 20 Moshi stickers. It is perfect for cute-loving girls of all ages. "MoshiMoshiKawaii" characters can also be found on babies' dummies and to collect in chocolate surprise eggs. "MoshiMoshiKawaii" started as a good luck charm in Japan and has since become the freshest publishing property around the world.